Does Beppe Grillo's Five Star Movement belong to the political family that ranges from the French National Front to Golden Dawn, or has it invented its very own kind of populism? Flickr/Tarantino Vincenzo. Some rights reserved. 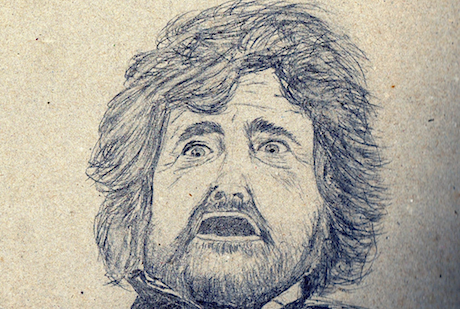 Speaking at a November 2012 rally in Aosta, Beppe Grillo repeated one of the mantras of the Five Star Movement (Movimento cinque stelle, M5S), the political organisation he and web entrepreneur Gianroberto Casaleggio founded only three years previously, and which would go on to become one of Italy’s biggest parties in the February 2013 general elections. The mantra serves as a reminder of the differences between the M5S and the right wing parties on the rise in the rest of Europe. More interestingly, however, it also sketches a political theory of populism, one in which parties of the populist family are pretty much interchangeable in their ability to capture discontent with the political mainstream. So interchangeable in fact that what form populism takes in each country depends, in the end, on little more than chance—or perhaps good timing. Maybe Grillo is right. Maybe we might as well be talking about an Italian Golden Dawn or National Front. After all, populism builds by definition on an indiscriminate contempt for the ruling elites, so why should we expect the outcome of that contempt to be any less open-ended? But then again, Italy may be different. Italy has already had its fair share of right wing populism. In fact, it has twice pioneered populism in government. The first time with fascism, a political phenomenon with many populist traits which, as we know, didn’t turn out too well for the country. On the bright side, that experience gave the country political antibodies that, although weaker by the year, still manage to keep certain ideas at bay. The second time came in the early 1990s with the collapse of the political system that had governed Italy since the end of WWII—the so-called First Republic—under the blows of the “Clean Hands” corruption investigation. The meltdown of the traditional power bloc revolving around the Christian Democratic party left a void that was rapidly filled by a centre-right alliance featuring two varieties of contemporary populism: the ethno-regionalist and xenophobic Northern League of the raucous Umberto Bossi, and the “tele-populism” of media magnate Silvio Berlusconi and his newly founded Forza Italia party. Italy’s new centre-right coalition ran the country on and off for almost ten years out of the past twenty (1994, 2001-06 and 2008-11), these governments being generally inept and increasingly scandal-ridden. Even at the worst of times, however, both Mr Berlusconi and the League’s leadership have been able to make up for their governmental failures by remaining on top of the populist game, successfully presenting themselves as outsiders (if not victims) of the system even after years of being deeply embedded in the country’s establishment. Whatever space there is in Italy for right-wing populist messages, in sum, a good chunk of it remains firmly guarded by Berlusconi & Co., thus reducing—although by no means eliminating—the M5S’s room for manoeuvre on that side. Yet lack of space on the right is not the only reason why Grillo is not Le Pen. To fully understand the nature of the M5S, and why it developed as it did, one needs to look also at the other side of the political spectrum, i.e. the left. The problem with Italy’s First Republic was not just corruption strictly defined. It was more generally a range of interconnected social and political ills including (but not limited to) widespread clientelism, bureaucratic inefficiency, enormous tax evasion, the absence of meritocracy, and the existence of powerful mafias in the south of the country with which the state often had ambiguous relations. All this was compounded—and partly caused—by an immobile political system in which ostracism against the Communist Party prevented any change in government. The demise of that system and the end of the Cold War opened a political transition whose outcome was difficult to predict. Many, however, expected—or at least hoped—that whatever was coming next would look more like a normal political system than the one they were leaving. Fast forward twenty years and ask any Italian whether that hope has been fulfilled. Chances are that they’ll tell you our “Second Republic” is, if anything, more corrupt—and unashamedly so—and less meritocratic than its predecessor, at least as inefficient and wasteful, and equally unable or unwilling to tackle organized crime—which, by the way, in the meantime established itself in the north as well. Add to that two decades of almost constant economic stagnation, a huge public debt and a growing generational divide in which the young have fewer and fewer opportunities, and you’ll see why many now look at the past with nostalgia. What went wrong? Part of the fault certainly lies with Silvio Berlusconi, who has used his time in power mostly to sort out his own problems rather than those of the country—and the two are usually very much at odds. More generally, over the past twenty years Berlusconi and his acolytes have managed to impose (or some would say strengthen) a socially detrimental cultural climate in the country, one that rewards good connections (and often good looks) over hard work, and deceit over honesty. But as they say it takes two to tango. One thing the Second Republic definitely achieved was political alternation, which brought the centre-left, and in particular the former communists, into power for almost as long as the right over the past two decades (1996-2001 and 2006-2008). Long excluded from government and custodians of the moral high ground—or so many thought—the renamed Left Democrats (and their allies) were legitimately expected by many to be the ones in the best position to make Italy a better place. And yet when in government the left proved largely inadequate to the task. This was partly because of a shortsighted political mindset, which made it put together, for merely electoral purposes, gargantuan coalitions of parties ranging from the centre to the radical left, each with its own ideas, interests and clienteles. Perhaps nothing epitomises the unviability of such political formulas better than the 281-page monster programme on which the Unione coalition ran in the 2006 elections: an all too clear example of how to say much in order to say nothing at all. To a certain extent, the left was itself part of the problem, as the many conflicts of interests and scandals uncovered on their side made increasingly clear. Right or wrong, as time went by, to many Italians it became less and less obvious what the difference between the two sides really was. And the many episodes in which the left appeared all too ready to lend a helping hand to Berlusconi certainly did not make the situation any better. It is in this context that the M5S was born and has grown as rapidly as we have seen: one in which dissatisfaction with mainstream politics reached an all-time high but, unlike the early 1990s, where many of the new discontents came from the left of the political spectrum. It is mainly to these people that Grillo spoke from the beginning. In 2009, right before launching his movement, Beppe Grillo attempted, unsuccessfully, to run in the primaries of the Democratic Party, which had recently been founded to merge most of the previous centre-left coalition into a single organisation. To many that was little more than an act of provocation, but it signalled quite clearly the type of audience the comedian was targeting. The agenda that the M5S has since proposed to these people is a mixed bag—and very often an ambiguous one on topics like immigration and citizenship. However, it would be difficult not to recognise most of its key components as naturally leftist themes, more so in a country like Italy: governmental transparency, public education, renewable energy, smart cities, public utilities, the dismantling of cartels and universal unemployment protection, just to mention a few. True, as the Movement has expanded over the years, its median supporter has changed too, becoming older, more rural and less internet-friendly than in the beginning. But even in this more balanced picture, the portion of the M5S’s base that should lean (centre-)left in “normal” times remains bigger than the one “stolen” from the right. The Democratic Party and its allies had to learn this the hard way in the February 2013 elections, when they realised that the 25.1 percent (almost nine million votes) obtained by the M5S had migrated to a great extent from their potential electorate. The M5S’s electoral result was astonishing. Too good in fact, as it immediately forced the Movement to face the dilemma between forming a governing coalition with the centre-left, at the risk of infuriating the purist elements of its electorate, or remaining inflexible and disappointing those pragmatists among its voters who hated the idea of wasting such an opportunity. Eventually Grillo and Casaleggio opted for purism, thus paving the way for the left-right coalition led by Enrico Letta. Even in opposition, a number of other contradictions in the Movement’s politics are emerging with increasing clarity. One is between the principle and practicability of the direct democracy professed by Grillo. Another is between the M5S’s ideas on transparency and its hostility towards the mainstream media. Most problematic of all, however, is the growing friction between Grillo and Casaleggio’s authoritarian style of leadership and increasingly vocal M5S parliamentarians. To a great extent, these problems are physiologically due to the nature of the M5S, and it is not at all clear whether and how they will be solved. Nor is it clear, however, whether they are harming the Movement. For one thing, signs are contradictory: the M5S gravitates stably to around 20 per cent in opinion polls, but it has performed quite poorly in some recent local elections. The volatility of Italy’s political and economic situation makes any prediction futile at this point. Much in the M5S’s future performance will depend on the development of the crisis and the policy choices of Letta’s government. Also, and perhaps more interestingly, it will depend on party developments both on the right, where Berlusconi is more belligerent than ever after a tax fraud conviction which should soon put him out of parliament, and on the left, where the Mayor of Florence, Matteo Renzi—himself a bit of a populist—looks set to win the Democratic Party leadership in next month’s primaries. Though by no means impossible, it is highly unlikely that Italy will hold new general elections before next spring. The May 2014 European Parliament elections will therefore be the first true political test for the M5S after its February exploit. Then we will have a clearer idea of whether the Movement is really here to stay—and whether we should start talking about a Third Republic.